I think it's a two-cups-of-hot-chocolate morning, my friends! And a little cocoa sprinkled on top to look pretty. Because look at all the happiness we have to share this morning! Yesterday (Tuesday Jan. 24): Clarbojahn's Blog: Part 2 of our interview and a giveaway of a hard cover copy of Punxsutawney Phyllis. Tomorrow (Thurs. Jan. 26): Corey Schwartz's Blog, Thing 1 and Thing 2. This one is all about where the idea for Phyllis came from and will be in two parts. I'm not sure yet when part 2 will be. Friday Jan. 27: Leigh Covington's Blog. This one is a (brief!) interview with Phyllis herself! She emerged from her burrow just because she likes Leigh. There will be a giveaway of a hard cover copy of Punxsutawney Phyllis here too! Sat. Jan. 28: Iza Trapani's Blog, In And Out Of My Studio. A chat with one of my favorite author/illustrators who may or may not be appearing on this blog soon (I could tell you, but then it wouldn't be a secret :)) There will be a giveaway of a hardcover copy of Punxsutawney Phyllis on this one, too! I don't know Sylvia, but all the others are wonderful writers with great blogs. I hope you will do them the favor of a visit! Next, you still have today to comment on Monday's Author/Illustrator Interview with Michael Garland for a chance at one of his books! If you haven't read the interview and commented yet, hop on over after you finish Would You Read It and leave your thoughts for today's participant. Which brings me to today's participant, the lovely Christie whom you've already met thrice before - she's that prolific! The Pitch: Last year, Solomon was finally old enough to help with the harvesting of the raisins, but it rained. This year, he prays for no rain so the crops won't get ruined and the family can make money at the festival. Will the rain hold off this year so Solomon can finally prove to his family that he really is old enough to help out? Please send YOUR pitches for the coming weeks! For rules and where to submit, click on this link Would You Read It or on the Would You Read It tab in the bar above. Pitches are currently queued through March 14, but there are lots of openings after that, so send your pitch for a chance to be read by editor Erin Molta! Please join us Friday for Perfect Picture Books! And the winner of the Michael Garland book giveaway! I'm afraid it really didn't grab me. This pitch is lacking a hook for kids really. I can see how adults would relate to it, but I think it needs a stronger motive than an adult one. Sorry! You're the popular one, Susanna! I'll have to do a visit or two. I like the idea of the book. Uncertainty about rain definitely creates tension. One of my favorite books is Come On Rain! Phyllis says thank you :) And I can't wait to see your question and pitch!! Thanks for your comment for Christie. It does sound interesting, but I probably wouldn't read it. It's just not my kind of thing. Susanna- nice work this week! How excellent for you. I will have to check out these blogs! With GroundHog day coming I'd hate to miss them. As for the pitch, I'm a maybe. I think the beginning is good but I feel as though there might be other ways in which Solomon can prove to his family that he's old enough to help out. Maybe the rain last year gives him the opportunity to think beyond the raisin harvest. He can be creative and inventive in his thinking and with a picture book you can really have some fun with his ideas. Wow, what a week for you and Phyllis. Thanks for letting us know so we can check out all these blogs! Love Phyllis' tiara, and congrats on the blog features, Susanna! About Christie's pitch, I'd like to see more details...a hook or two, something specific that makes me wonder just how Solomon will prove he's old enough to harvest the raisins. While praying is good, taking matters into his own hands would be even better. I know! Busy, busy! I have no idea how it happened! Thanks for your interest - I know all those lovely blogging ladies will be grateful for visits! Thanks for you comments for Christie. Thanks, Dede! Phyllis is so glad you love her tiara - she loves it too!!! Thanks for your comments for Christie! Thanks for you enthusiasm, Tracy! I know these wonderful bloggers will be glad to have visitors! And thank you for your thoughtful comments for Christie! You look fab, Phyllis! :) And congrats, Susanna (& Phyllis) on all of the guest blogs this week. You rock! As for the pitch, I was intrigued by the idea of a raisin farm (instead of a grape farm). I also like the idea of a kid having to wait til he is a certain age...I think kids always feel like they are in that waiting game. But the pitch itself lacked a hook for me. I would love to hear about his plan on how to prove himself with or without rain this year. Thanks, Marcie! Phyllis says if you're experiencing tiara-envy she might loan it to you sometime if you ask very nicely :) Thanks so much for your comments for Christie, too! Pitch: Don't think you need to mention rain twice in pitch. Would like to see more action. Is this magical --raisins growing on vines? Would like to know a little more. Thanks so much for visiting them both, Pat. I really appreciate it! And your mother has an awesome name :) Also, thanks for your comments for Christie. Oh my goodness Susanna - you and Phyllis are super popular this week! I love it! And I'm looking forward to sharing Phyllis' interview and giveaway! So fun! Solomon's Raisin Farm sounds really cute! I'd read it for sure. It'd be cool to find out more about raisins, too. Congrats on all your blog features, Susanna! I'll definitely have to check out those blogs. Hope you're having a great week! Thanks for the shout out! You are the awesome guest so many places! :) I'll check out these other blogs and interviews. So interesting. Thanks for the interview, Clar :) And I hope you'll enjoy the other ones - they're all pretty different from each other. I would have to say no. This type of story isn't my cup of tea in the first place, but the pitch isn't helping to hook me in. The conflict seems a bit watery, and the pitch itself could be tightened up to eliminate repetition. I have a general question about pitches: Should they always end with a question? I'm not a fan of the question, but if that's how they are usually written, it would be good to know! Oh dear, I just noticed the "watery" part of the comment, which was not intended as a pun. Sorry - didn't mean to be glib at all! Thanks for your comments for Christie, Renee (and no worries about the pun - I didn't even catch it until you said it :)) No, I don't think pitches have to, or necessarily should, end with a question. Some do and some don't. And I don't think it's me winning the popularity contest - if you'll notice, there's a common theme and that's Phyllis! There are many farm stories out there and I've never heard of a raisin farm! You don't harvest them; you dry grapes. So really Solomon must have a vineyard or a raisin processing factory. The idea is odd, put this way; it seems like the wrong title and there's no sense of what activities are involved to encourage me to read it. What a fab week you have lined up Susanna--that's great! As for the pitch--maybe, mostly because I'm curious about the raisin farm itself. Pitch - sorry I would have to say no right now. The pitch needs to be tighter. What is the hook? From the pitch I can't tell what type of book is it sweet-sentimental, any humor, dramatic. From the pitch, I feel like rain/weather is the main character. The story isn't dependent on Solomon proving himself — it all depends on the rain. I think you could drop both or at least one finally. Glad to see you and Phyllis all over the web. Thanks everyone for your comments. The pitch was written a while back. I've since revised the story. It's not about his age anymore. But the looming weather of rain is the antagonist. Solomon and his whole family work hard to make raisins each year. But will the rain hold off long enough so the crops aren't ruined? Solomon and his cousins are planning something big to celebrate the sunny days. Phyllis is SO fashionable! I read Ms. Wild's newer pitch too. I like the newer one better than the older one. I really like the first two sentences in the new pitch and I think the third sentence should be more about the problem if the rain comes. I like the story idea! Solomon and his whole family work together to make raisins. This year they work harder than ever before as they race against the elements during the harvesting season. If it rains, they may not get a Thanksgiving turkey, Christmas candy, or even new shoes. 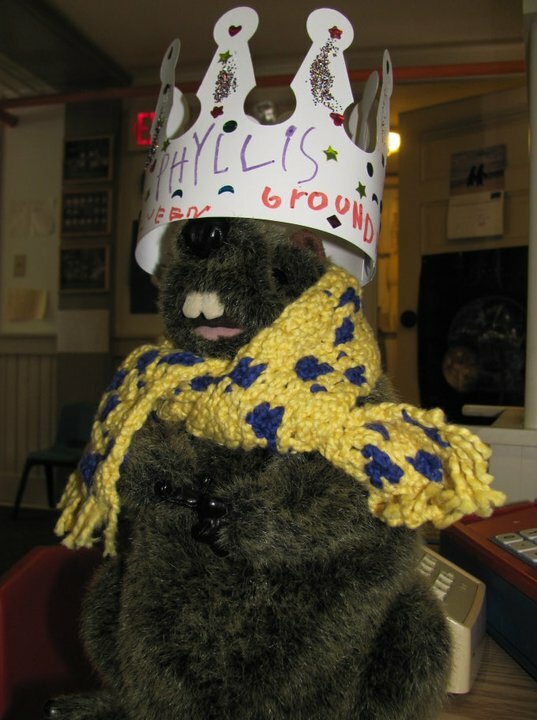 Congrats on your Punxsutawney Phyllis and the popularity contest.